Kitchen equipment can take up a lot of room, not so with the Panasonic Mixer MX-S301. The nifty handheld blender comes with several different attachments but can easily be stored in a cutlery drawer or cupboard (its 42.3 cm long, and 6.4 cm to 7.4 cm wide). 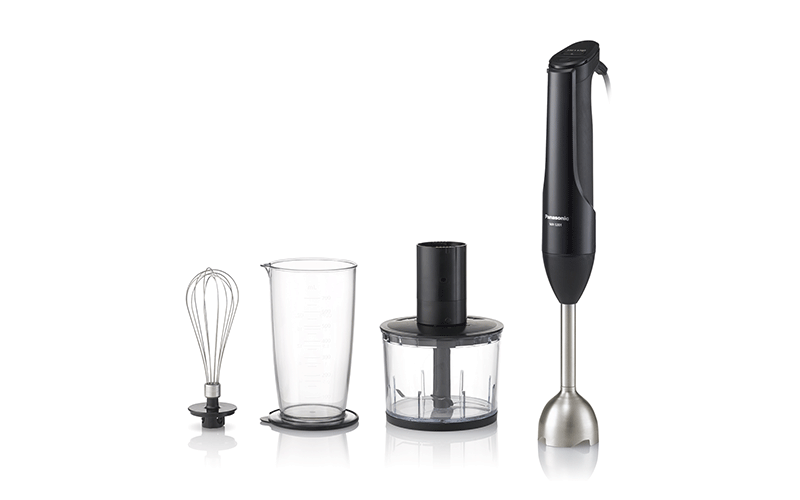 There are three attachments including a whisk, chopper and four-blade blender. The variety of attachments mean although the MX-S301 is small, it can play a key role in a wide range of dishes. The attachments can cut time when preparing a range of soups, sauces, desserts, smoothies, juices as well as many other recipes. The handheld mixer is ergonomic and intuitive to use. There are two different speeds available (high and low) along with a two-step on switch and a child lock as an added safety measure. All attachments are dishwasher safe too, helping to speed up the post cook clean-up process. The MX-S301 has a double motor protection system built in. This means that when the appliance becomes too hot or cold, the motor cuts out to avoid damage to the product or injury to the user. When BBC Good Food Middle East trialed the product, this only happened once, when whisking cream. Once the product cooled down the trial team were able to immediately resume use of the mixer. If you don’t have much space, and want to save time in the kitchen the MX-S301 is a good mixer to invest in. It won’t replace bigger food processors in the kitchen, but its perfect for home cooks looking for a bit of extra help, when whipping up midweek soups, smoothies and desserts. Details: for more information, visit Panasonic Middle East. If you like this article, you may like this review on the Bosch Food Processor.